The Markets Never Sleep shows how to analyze all the global markets and use timing and money management to control losses and reap significant rewards without using up all of one's emotional energy. 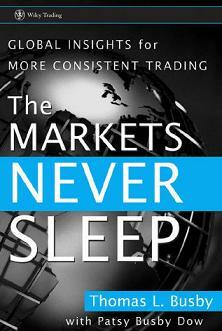 The Markets Never Sleep is a must-read for traders and investors who seek insight navigating the global markets. In The Markets Never Sleep, Busby reveals how you can use modern technology to take full advantage of the twenty-four-hour nature of the markets. He lays out the basics of how global markets work and explains the significance of understanding global connections and why traders need to know them, showing how to think globally and stay alert to any major geopolitical or economic event.